The Italian Riviera of Flowers (La Riviera dei Fiori) has something special to offer in every season of the year. That is why our holiday home in Piani Cipressa, situated between San Remo and Imperia, is the perfect holiday destination the whole year round, offering something for everyone. Enjoy the scenery: in fine, clear weather, you get a lovely view of the island of Corsica. Go for a walk, taking our house as your starting point. You can choose from two-, four- and six-hour walking routes through the hills. Visit one of the many nearby hamlets and enjoy the scenery, almost untouched since mediaeval times. You can also take walks along the coast, along a special extended footpath/cycle path. Go cycling. You can cycle across the hills or along the coast using the cycle path. There are also many mountain bike trails in the mountains and, for racing cyclists, there is the classic cycling route from Milan to San Remo (Cipressa is on the route). Admire the floral splendour of the Riviera of Flowers, in particular the world-famous Hanbury Gardens. Visit the artists’ village of Bussana Vecchia: in 1887, this village was devastated by an earthquake. Around 1960, scores of artists and hippies from across Europe flocked to this ghost village to live and work, despite the fact that the village had no running water or mains electricity. Soon, a very special artists’ village had emerged from the ruins of the old village. The locals now make their living from tourism. Enjoy artichokes fresh from the garden and admire the blossom on our fruit trees. Explore the gastronomic opportunities around Cipressa. There is a wide selection of restaurants within easy distance of our house, both small and large. 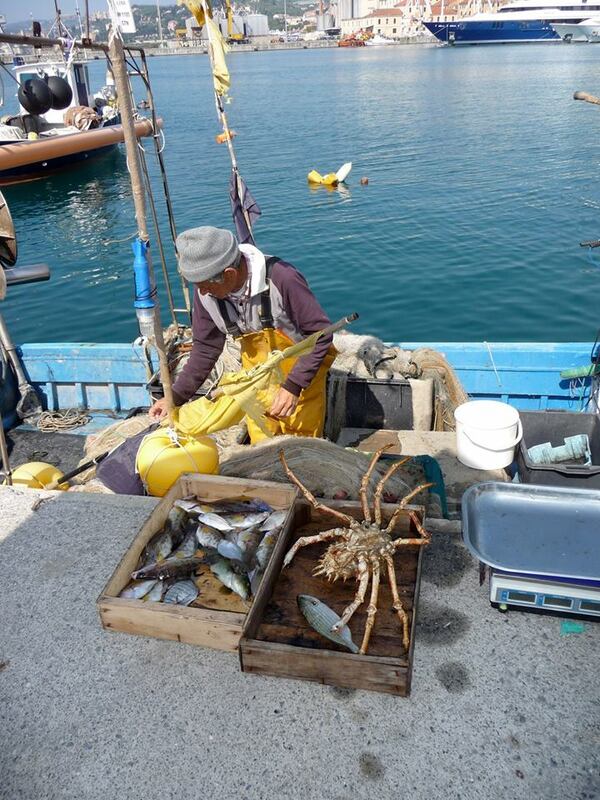 Visit the nearby harbours of San Lorenzo al Mare or Santo Stefano al Mare. You can plan a sailing trip setting off from one of these harbours or go sea-fishing. Rent our house for a photography holiday: the spring sun makes for some fantastic pics. Play a few holes at the nearby golf course of Castellaro. This beautifully situated course is only 15 minutes’ walk from our house. Go to the beach. It’s a real joy being by the sea and on the beach. Choose a different beach every day; there are plenty of options to choose from: sand beaches or plain pebble/rock beaches, open sea beaches or sheltered ones with shallow water which are ideal for children. Italians often rent a parasol and a lounger, but you are free to bring your own stuff, of course. Play a game of volleyball. On the beach at nearby San Lorenzo al Mare, there’s a small beach volleyball court where everyone is welcome to join in. Take a refreshing walk along the seashore (with a nice breeze) or a stroll through the hilly hinterland. Of course, you can also go for a night-time stroll, under the region’s unbelievably starry skies. Visit the mountain villages. Temperatures here are usually slightly cooler, allowing you to spend a delightful afternoon lounging on the terrace. Drop in on a fiesta. Every evening, there’s a party in one of the surrounding villages based on a particular culinary theme (gnocchi, mushrooms, wine, pasta, olives etc.) Or visit cultural events in the villages along the coast. You can get a guide to all the activities on offer from the local tourist information offices, but you can also find the same information displayed on roadside posters all over the region. Admire the luxurious yachts moored in the beautiful old harbour of Imperia Oneglia. Saint Tropez is nothing compared to this! Under the arches you can find a wide range of restaurants overlooking the harbour. Look out for whales and dolphins in the international marine nature reserve between Liguria and Corsica. The organisation whalewatching.it organises boat trips. Or just hire a sailing boat from one of the harbour towns. Enjoy fruit fresh from the garden and admire the blossoming oleander, bougainvillea and polygona. Snorkelling and diving: near our house, there are several rocky beaches which are very popular with the Italians. People go snorkelling and diving here every day and occasionally you can even see divers with harpoons walking past at night. Enjoy a morning’s or an afternoon’s cycling. For example, take a (one-hour) ride in the morning to San Remo and spend a lovely day there, in the refreshing cool of the town centre. Go for a swim. You will definitely be able to swim in the sea until the end of October. Enjoy grapes and figs fresh from the garden. Rent our house for a photography holiday: because of the beautiful light in this period, photography holidays are very much in demand during this season. Take a trek in the mountains. Choose a different route every day. Go cycling along the seafront or in the hills. Do a spot of shopping. With fashionable shops located within its magnificent colonnaded shopping mall, Imperia Oneglia is a paradise for shoppers. San Remo is renowned as a fashionable shopping town and features all the major labels. Visit Piedmont and enjoy slow-food specialities, such as truffles, chestnuts, chocolate etc. Taste the local young wine (Vermentino) and mushrooms, for which the region is renowned. Put on your culture hat and visit Genoa, Turin, Monaco and Nice. Make sure you also take an evening walk in these towns and enjoy the beautifully illuminated monuments. One hundred years ago, the jet set of Europe flocked to the Italian Riviera of Flowers in the winter because of its mild microclimate. This region remains lively well into the winter months, with many people from Milan and Turin owning a second home on the Ligurian coast. Take a ski trip or go cross-country skiing. Only just over one hour’s drive from Cipressa and you’re there! For example, you could check out the ski resorts of Limone, Monesi or Garessio. Try something different this season: enjoy spectacular sunrises and sunsets at our house!! Visit the famous San Remo Festival. This music festival has been held in February or March every year since 1951. It is extremely popular in Italy and attracts one of the largest audiences of any of the country’s TV programmes. Many artists, such as Eros Ramazotti, Andrea Bocelli and Laura Pausini have shot to stardom thanks to this festival. Cheer on the cyclists participating in the major Milan – San Remo cycling race. This first major cycling race of the season passes through the village of Cipressa! Taste freshly-pressed olive oils produced by local farmers. Or visit the olive museum in Imperia Oneglia and see how olive oil is produced. Connoisseurs say that the best olive oil comes from the region around Imperia. Enjoy the upcoming spring: the bright yellow mimosa is in bloom and orange and lemon trees offer bountiful quantities of their orange and yellow fruits. Go cycling or walking along the coast. Try your luck at San Remo casino, the first-ever casino in Italy’s history. Visit Villa Nobel, the home of Alfred Nobel, who also lived in San Remo. Do a spot of shopping. With fashionable shops located within its magnificent colonnaded shopping mall, Imperia Oneglia is a paradise for shoppers. • Visit the artists’ village of Bussana Vecchia: in 1887, this village was devastated by an earthquake. Around 1960, scores of artists and hippies from across Europe flocked to this ghost village to live and work, despite the fact that the village had no running water or mains electricity. Soon, a very special artists’ village had emerged from the ruins of the old village. The locals now make their living from tourism. Take a swim in Imperia’s indoor pool (make sure you wear a swimming cap, though, as it is compulsory). Enjoy the December festivities. December in San Remo and Imperia has an especially festive atmosphere. Make your holiday a language holiday. San Remo offers many good Italian courses and you can even book classes with private teachers.